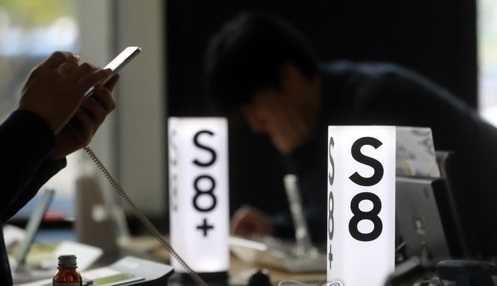 There have no battery problems reported in Samsung Electronics Co.'s latest Galaxy S8 and the Galaxy S8 Plus smartphones since their launch in April, industry sources said Sunday. The company's new flagship went on sale on April 21 following the halt of the production and recall of the ill-fated Galaxy Note 7 phablet due to some units catching fire while being recharged. The company admitted that faulty batteries were behind the problem. The sources attributed the lack of any incidents so far to the company's commitment to strict quality protocols across its entire development process. Samsung refrained from expanding battery capacity, with the Galaxy S8 and Galaxy S8 Plus shipping with non-removable 3,000 mAh and 3,500 mAh batteries, respectively. The Note 7 had a 3,500 mAh battery. Samsung changed its phone-testing facilities around the globe to include its eight-point battery safety process by implementing four brand new tests, including X-raying all of its phones prior to shipping. The company adopted the safety checkpoints across its entire phone lineup and not just its flagships. Samsung's new enhanced multilayer safety measures protocol was implemented for strict safety standards on every element of the company's devices, including the overall design and materials used.